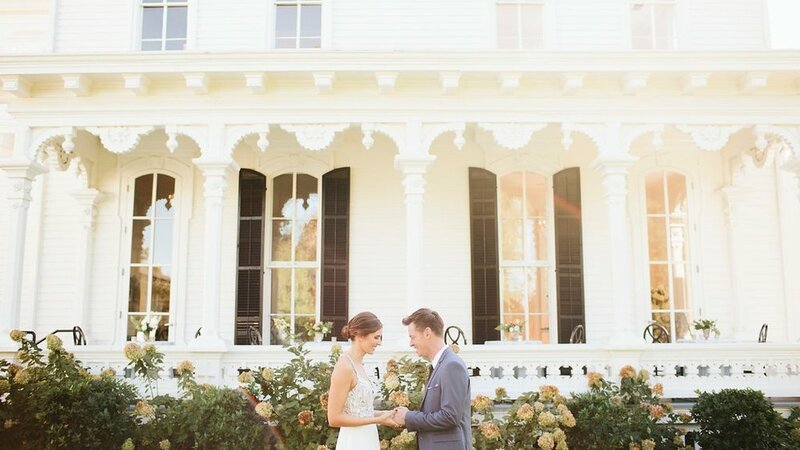 The inspiration behind Merrimon-Wynne’s transformation into a wedding venue was the idea that the house’s rich history and beauty would serve as the perfect backdrop for an inviting yet grand celebration. The mansion was built in 1876 and it was restored to its original grandeur in 2014 so that couples can experience the magic of Merrimon-Wynne and share it with their guests on their wedding day. RENTAL OF THE MERRIMON-WYNNE HOUSE MEANS THE PROPERTY AND FACILITIES ARE AVAILABLE EXCLUSIVELY TO YOU FOR THE ENTIRE DAY, SO START BY GETTING READY IN THE LUXURY OF OUR TWO BRIDAL SUITES OR SEPARATE GROOMS ROOM, COMPLETE WITH A PLENTY OF NATURAL LIGHT, LOUNGE FURNITURE AND MIRRORS TO GET READY WITH! THERE ARE SEVERAL AREAS ACROSS THE PROPERTY - BOTH INDOORS AND OUTDOORS - THAT ALLOW FOR A TRULY UNIQUE CEREMONY EXPERIENCE. SAY YOUR VOWS ON OUR LAWN UNDER THE QUInTeSSENTIAL SOUTHERN PECAN TREES, OR IN FRONT OF THE CARRIAGE HOUSE FOR A MORE STRUCTURED BACKDROP. ENHANCE THE PROPERTY WITH YOUR OWN STYLE - MARKET LIGHTS, HANGING DRAPERY, LUsCIouS FLORAL ARBORS - WE CAN MAKE YOUR VISION A REALITY! GUESTS CAN FLOW FROM THE CEREMONY TO OUR MAIN HOUSE, RICH WITH SOUTHERN CHARM. FILLED WITH ORIGINAL FLOORING AND FIRE PLACE MANTELS, HANGING CHANDELIERS AND SWEEPING PORCHES, EXPLORING THE HOUSE IS ALWAYS A MEMORABLE EXPERIENCE FOR YOUR GUESTS. COMPLIMENTARY LAWN GAMES WILL BREAK THE ICE, AND ADDING PERSONAL TOUCHES, LIKE A SIGNATURE DRINK TO YOUR BAR OR AN INTERACTIVE GUEST BOOK, WILL LEAVE A LASTING IMPRESSION. Continue on to dinner in our Carriage House which boasts grande chandeliers, exposed beams and rolling glass doors that open to our Pergola and Lawn. FOR A COMPLETELY OUTDOOR EXPERIENCE, DINE AL FRESCO ON OUR LAWN UNDER TWINKLE LIGHTS AND THE STARS or host a casual cocktail-style event with stations on the lawn and in the main house. NOT TO BE OUT-DONE, OUR Carriage House IS ALSO A PERFECT SETTING TO BRING YOUR PARTY TO LIFE! THE Merrimon-Wynne House IS ABLE TO ACCOMMODATE ANY STYLE OF ENTERTAINMENT! We invite you to be our guest and to become a part of the legacy of the Merrimon-Wynne House.